One of the privileges of the Cité des arts’ tenants (the building complex where I live in the 4th borough) is to have access to the public library Forney, which is specialized in the handcraft, the fine arts, the fashion and costumes, the art of gardening, the decorative arts and the graphic arts. Its facilities are right across the street from home. And this is a very beautiful building! At the beginning, in 1500, this was the Hotel of Sens, the gothic castle of the archbishops of Paris. A century later the Queen Margot lived in there for a year (Marguerite of Valois). I’m so impressed! The rue Figuier’s access (the fig tree street) leads to the entrance through a courtyard. Crossing this courtyard I have the impression of to walk in the very steps of the daughter of Catherine of Medicis (Marguerite of Valois). In 1572, Marguerite of Valois married Henri of Navarre (later King Henri IV of France). Marguerite was a catholic and Henri was a protestant. This union trigged the sad event of the St-Barthelemy’s Massacre, degenerating in a war of religions in the entire country. A famous French movie narrates those events, “La reine Margot”, by Patrice Chéreau, starring Isabelle Adjani. I’m tempted to watch this movie one more time. Scene after scene, the actress wears fabulous embroidered historical gowns...And herself, she is so beautiful. The Museum of Cluny is the national museum of Middle ages. For that museum also, the Cité international des arts’s tenants have free passes. I feel so lucky! 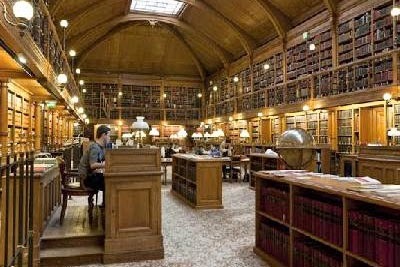 Its collection includes all sorts of medieval objects and the extraordinary tapestry of the Dame à la licorne (The Lady and the Unicorn). The Hotel of Cluny was built at the end of the 1400’s, in the flamboyant gothic architectural style. I have to walk 30 minutes to go to the Museum of Cluny. 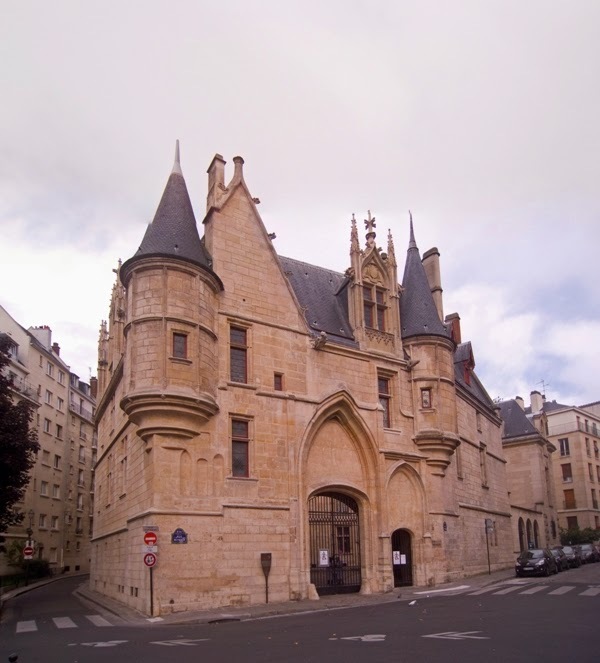 Nearby there is also the famous University of Sorbonne. Today, I visit the Museum of Cluny mainly for a guided tour: Vêtements et parures du Moyen âge (Clothes and Apparels of the Middle Age). Wandering from a hall to another, we can admire sculptures, stained glasses, illuminations and paintings. The guide explains the evolution of the shirt. The shirt originates from the roman tunic. A type of clothing worn for 1000 years, indifferently used by men and women. Many variations mark the evolution of the tunic, it was alternately long or short; one layer or many layers; split or full fabric; plain or colored fabric; embroidered or not. In sum, through the centuries the tunics have been known in a wide variety before the details of their confection began to reveal the social rank, the profession or the gender. Unfortunately, I couldn't salute the Lady and the Unicorn. (I say the Lady, but in fact it is question of six large tapestries). The Monalisa of Cluny (the Lady) hadn't leaved the museum for 20 years. But at the very moment I come to visit her, she travels in Japan. She'll come back in October to be accommodated in a new set up. Great! At the end of October I'll still be in Paris. In total, 250 artists, from around the world, live at the International City of Arts. Many wings form this complex, an ill convenient situation if you want to make new relationships. Welcoming cocktails and openings of exhibitions in the two galleries of art of the complex allow some opportunities to fraternize. Otherwise, the contacts happen among neighbours in corridors, laundrette, entrance hall, stairs and elevator. Everybody's busy. When Kaori Nakamatsu, a Japanese artist, visited me I was delighted. 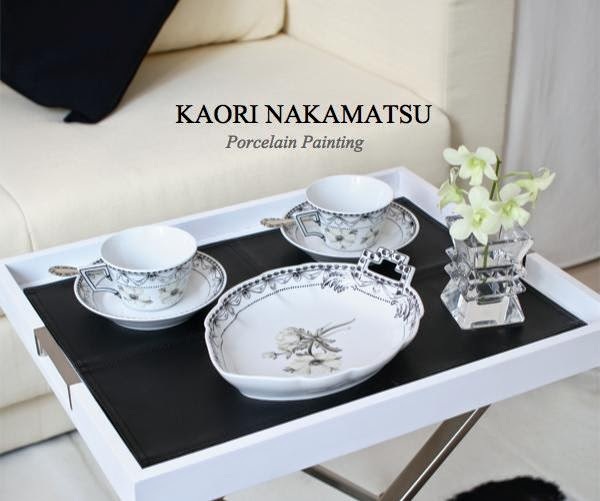 Kaori practices the art of painting china. We live in the same building, her, on the courtyard side (I'm on the street side). O.K., it means no traffic noise for her but she is deprived of the view on the Seine River, the riverboats, the gigantic chestnut trees and... the hoboes. Instead, her window view shows huge stone walls and their vines. Late at night, neighbors chat in the courtyard. Her residence stay extends for three months. She would like to stay longer. So, she trys to prolong her visa and to find accomodation. She would also like to exhibit in Paris, but the International City of Arts' exhibition hall is unavailable. One has to make a reservation many months in advance. In addition, the post fees for her pieces of art, coming from Japan, are prohibitive. So her plans were to create new pieces of art during her stay but the delivery delays, for her artist supplies, were very slow. And when cardboard boxes arrived at long last, they had been damaged. It means a big effort of adjustment for her. And she's trying to adapt the best she can. Every morning Kaori follows French classes. Those obstacles, that Kaori encounters, show how much it could be difficult to adapt in our new life in Paris. We have to face many challenges, identify new anchorage points, built a new day to day life to achieve the well being necessary to be able to create. It takes so little to perturb this equilibrium. I lent Kaori my book about the Paris' artisans. One of those artisans practices the same art as Kaori, china painting. This is a little thing that I can do to help her to appreciate Paris. At first glance, the workshop is inviting. The boss and three workmates work in silence, standing up (it's a tiny workshop, there is even no room for chairs). Around the worktable, in the center of the workshop, everyone is focused on his stained glass piece. 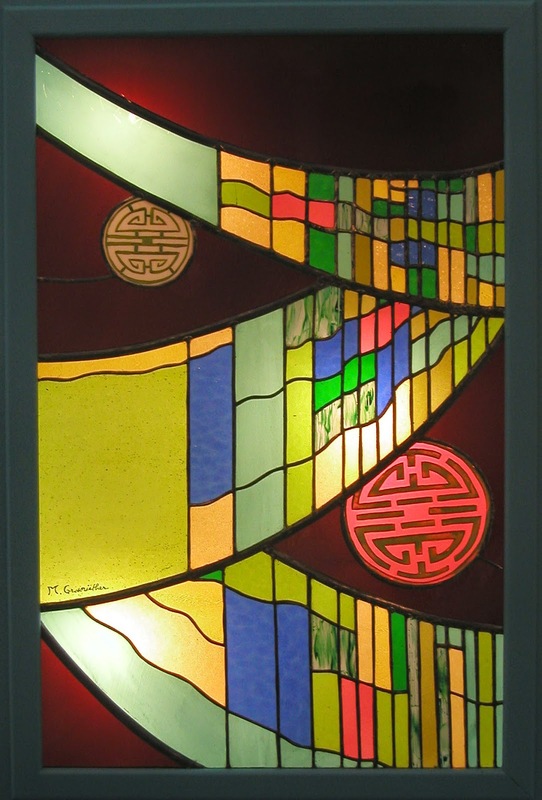 He went back to school and achieved a professional high school degree in the stained glass technique. He restores and creates for private clients. It is noticeable, in posh buildings of Paris, the stair cases are ornamented with magnificent stained glasses. Mr. Grossriether's diploma doesn't allow him the restoration of churches, another specialty. To each one, his specialty. 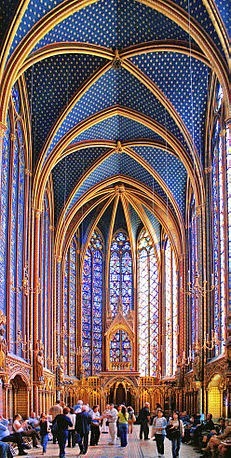 From 1226 to 1270, the King Louis IX of France (whom will be canonized eventually) commanded the construction of the Holy chapel, in the purpose of gathering and storing the Holy Relics of the Passion of Christ. At high price, Louis had acquired some of them. These acquisitions had a great effect on the prestige of France. For the medieval people, the country and the city of Paris became like a new Jerusalem, an important Christian capital. In the Louis' vision, the Holy Chapel was destined to serve as a jewel box for the crown of thorns, a nail from the cross of the Passion and other effects that belonged to Christ. The Holy Chapel stands on two floors: the Low Chapel and the High Chapel. The relics were guarded and worshiped in the High Chapel, the access exclusively permitted to the King, his entourage and the priests. A second floor outdoor walkway linked the Royal Palace and the Holy Chapel. The Low Chapel was reserved to the Palace's staff. Its architecture is characterized by arches, colonnades and trusts. And what about the common people? They simply hadn't access. The most famous pictures are of the High Chapel. Sumptuous stained glass suround the hall. They are raised at an impressive height. Their intense colored designs narrate some passages of the Bible, the Ancient and the New Testaments. Both, in the High and in the Low Chapels the decoration is heavily charged with the Louis IX's coats of arms: fleur-de-lis on blue background paired with towers on red background, referring to Blanche of Castille's coats of arms, Louis' mother. During the Revolution (1789), the Holy Chapel, as a symbol of royalty, suffered from vandalism. But its stained glass has been spared. The Holy Relics of Christ still exist. They are kept safely in Notre-Dame of Paris. I intent to visit them. Every first Friday of the month they are presented to the public. Nowadays, the Holy Chapel isn't a place of worship, but a most frequented tourist attraction. Between the guided tours and the crowd of tourists, praying is a difficult challenge even for the most pious believer. The Conciergerie is one of the buildings of the Royal Palace's ensemble. For many centuries, around 1400 years, the Conciergerie (the name could be translated something like: the caretaker office) embodied the heart of the royal power, a mighty symbol of the monarchy. Later, this building also hosted the Parliament of Paris'. In 1370, the nature of its vocation changed, it became a state jail. A new manager, a caretaker, was designated, by this, giving the present name of the building. At the French Revolution, the Revolutionary Tribunal sat in its high ceiling halls, beside the court of justice. The prisoners' quarters were on the lower floor of the facilities. Rapidly the dungeons were overcrowd by the Parisian's prisoners and others prisoners coming from all over France. In any event, the journey at the Conciergerie was short. Whether a prisoner was acquitted and walked out free, or one was condemned and went right away to the guillotine. The most famous prisoner was Queen Marie-Antoinette, In 1793, she was decapitated on the public place. In the Conciergerie, her cell was restored, herself and her jailers are presented. This building is charged with so much tragic events, hosted so many historical characters. When I think of those people, they stop of being only names in books of History or characters in movies. They are real human beings, men and women, who suffered in those narrow unhealthy cells. At night they must have been frightened in the total darkness, but were still fighting for their just cause. Those dungeons imprisoned also innocent people who were unfortunately trapped in the vortex of History. That visit urges me to read books about the History of France. I visit Johanna Braitbart's workshop, a fashion accessory's artisan, on her visit card it is also mentioned: Jewels, Embroideries and Accessories. On my way to her workshop (on the Blancs-Manteaux street) I take the Temple's street. I know well this particular street because there are many stores selling beads, sequins and other jewel supplies. Ah! Beads, the dream of every embroiderer! Some stores sell by the piece or little amount but other stores specify they sell only in large amount. I haven't yet dared to visit the latter. At the boutique of Johanna Braitbart I'm told that she is on vacation. But she is still everywhere in the store by the expression of her personality. The way the purses are adorned is very tasteful. With Johanna Braitbart a plain hat becomes an elegant and original millinery. 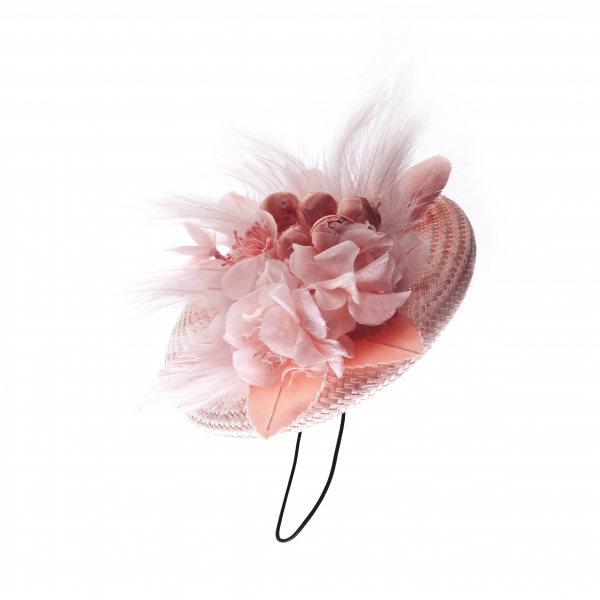 And the sophisticated headgear can completely transform a plain outfit or can give zest at a chic evening gown. Johanna Braitbart design all sort of accessories in the 1900-1930's style: headbands, scarf-collar, covers, etc. Laces, feathers, jet beads and jewels are her main inspiration and basic material. The artisan of Paris' directory, that I consult, was edited in 2007, of course things may have changed since. Indeed, when I headed to the Sycomore's Workshop I expected to meet up a maker of oboes and bassoons. Apparently, Olivier Cottet, after 30 year of experience in the making of wind musical instruments, had given his place to the young stringed instrument maker Christelle Caillot. When I arrived she was just finishing a brand new guitar. She was tightening the first strings of the instrument and was testing their sound, the very first musical notes of this instrument. Here is a link to a short documentary about Christelle Caillot, we watch her at work, she plays the guitar and this is magic. I love reading about your adventures in France. It reminds me of the things I saw when I was there. It was long ago now and only a very short visit. So interesting! Thank you for sharing your 2013 travelogee entries and photos with us. 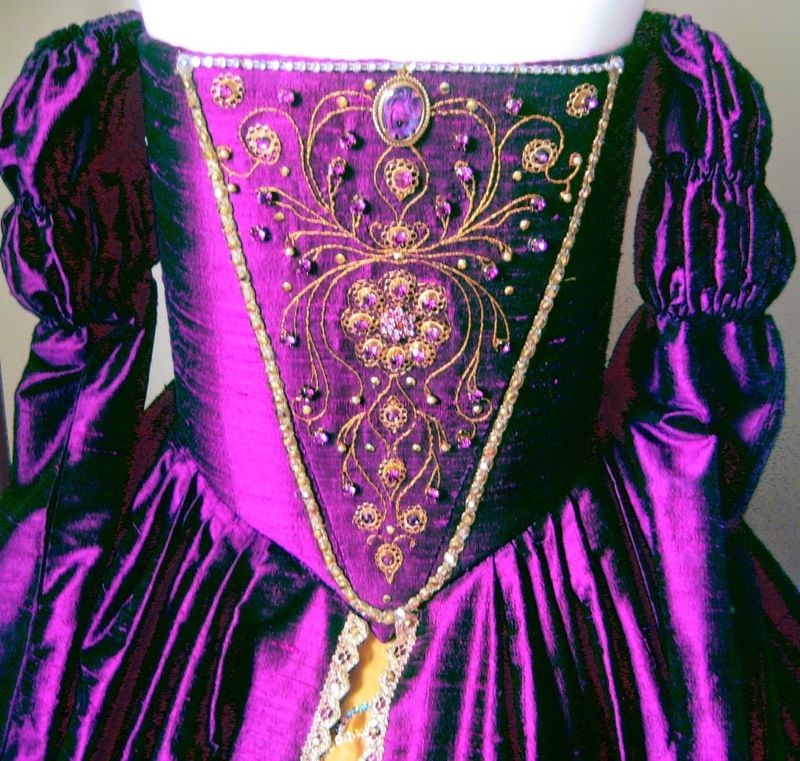 Queen Margot's gown is beautiful - what a treat to see a photo of it. I love all the photos you are sharing. The chapel cries out to be stitched in canvaswork! Mid May, time for a stitching check in..